The product in this giveaway was gifted to me by It Cosmetics. All opinions are 100% my own. Photos used in this post are from the It Cosmetics website. This post does contain affiliated links and ads. 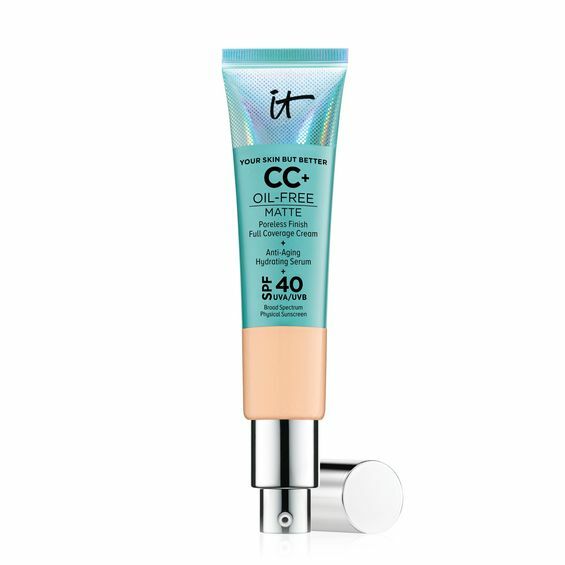 Anyone else obsessed with the It Cosmetics Your Skin But Better CC+ Cream? It has been one of my favorites for in the winter when my skin is a little bit dryer. You can even check out my review here that I did a while ago. Well now It Cosmetics is releasing an all new CC cream. This is the Your Skin But Better CC+ Cream Oil-Free Matte with SPF 40. Yes, you read that correctly MATTE. You have no idea how excited I am for this new product. The original gives me a little bit of a dewy look which I like in the winter, but not so much in the summer. So the matte would be perfect. The Your Skin But Better CC+ Cream Oil-Free Matte with SPF 40 is full coverage and works on pretty much any skin type. And according to the It Cosmetics website it should last up to 12 hours with a matte finish. This is literally a dream come true. One thing that I find really exciting about this new CC cream is that it comes in 12 different shades which is a pretty big step compared to the original which only has 7 shades. So they did expand the shade range a little bit. I just wanted to share with you a little bit of enough on the new product in case you were interested in trying it out. And I also thought this would be a good time to do a giveaway! It Cosmetics actually gifted me the shade Medium and since I am super pale, obviously medium will not work for me. So I am going to be giving it away to one of you! You can enter the giveaway right below. It is only open to the US and you must be 18 years or older to enter or have your parents permission. The giveaway is from now until August 1st 2018. The winner will be contacted by email.